Customers browse the items at last year’s Annual Charity Sports Auction. The Sport Management (SPM) Club will hold its ninth Annual Charity Sports Auction on Saturday, Dec. 7, at the Carrier Dome. 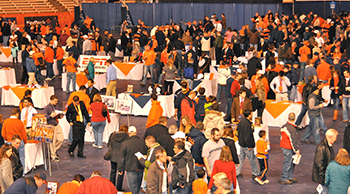 Silent bidding on hundreds of auction items, including sports memorabilia and hands-on experiences, electronics and tickets to major sporting events, will take place in the backcourt during the SU men’s basketball game against Binghamton University. Doors will open for the auction at 5 p.m. through Gates A, B, C and E. All other gates will open as usual at 5:30 p.m. The SPM Club is a student-run organization in the David B. Falk College of Sport and Human Dynamics’ Sport Management Department. Since its founding in 2005, the club has raised nearly $200,000 for local charities. All of the proceeds from this year’s auction will benefit the Food Bank of Central New York. Food Bank of Central New York is a not-for-profit organization working to eliminate hunger through nutritious food distribution, education and advocacy in cooperation with the community. Food Bank serves as the primary food supplier for 261 emergency food assistance programs in 11 counties of New York State, distributing 13,420,441 pounds of food last year. Visit http://www.foodbankcny.org for more information. Previous beneficiaries of the club’s annual charity auction have included the Boys & Girls Clubs, American Diabetes Association, Golisano Children’s Hospital at Upstate, the Ronald McDonald House Charities of CNY, the Central New York SPCA, the Upstate Cancer Center and most recently, Special Olympics New York, which was given a record-breaking $35,239. The purchase of a game ticket for the Dec. 7 men’s basketball game is necessary for access to the auction. Tickets can be purchased on the SU Athletics’ Web site (http://suathletics.com) or at the Carrier Dome Box Office. Tickets can also be ordered by phone at 1-800-DOMETIX. Follow the Syracuse Charity Auction on Twitter @SU_SPM_Auction, and on Facebook. Visit www.sucharitysportsauction.com for the most current information on the auction.